–green paint – I used “Soapstone” in Behr Marquee – it’s such an amazing color! I’m weak for green anyways, but it’s just so perfect. (I was sent paint for my project). 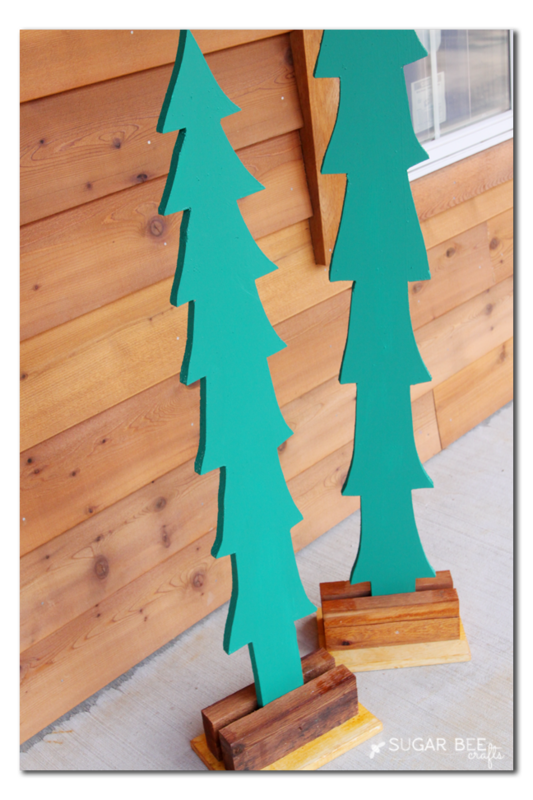 First up, cut about 10 inches off of your 1×8 board – this will be used as the very base of your tree. Then with the remaining board, draw out a tree shape. It’s doesn’t have to be perfect – I think the imperfection is part of the charm. The triangle-ish shapes are smaller and closer together towards the top and spread out as you get to the bottom of the tree. 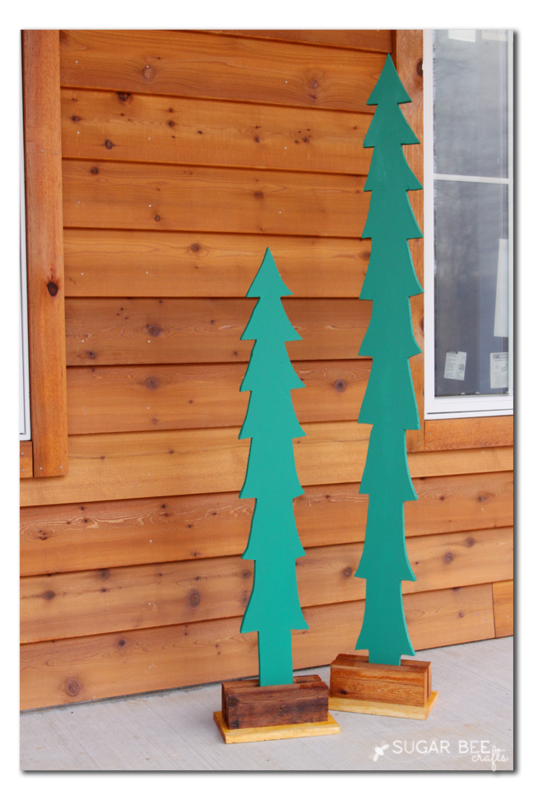 I have 2 trees that are 2 different heights – it’s fun to have some variation. At the bottom just come straight down with a rectangle. 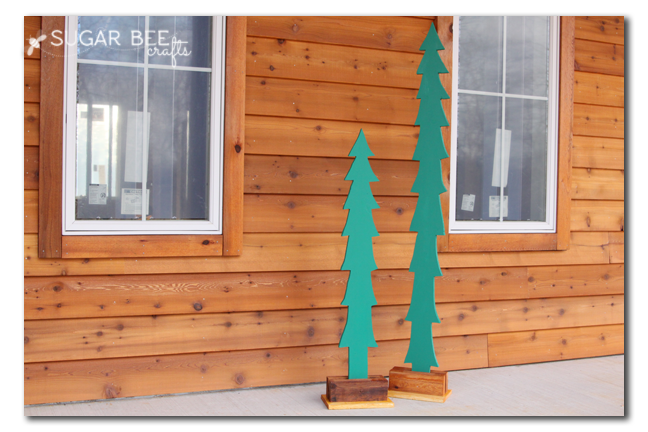 You can see the basic shape in this photo (and p.s., you get a sneak peek of our new cedar siding! more about that to come) Now, don’t get scared, but you’re going to cut these out with a power tool – you can totally do it. It’s a jigsaw and it’s not too intimidating – you just squeeze the trigger and follow along the lines you just drew. If I can do it, you can too – – Now, the fun part – painting! I painted the back and edges first, then flipped the trees over and painted the front. 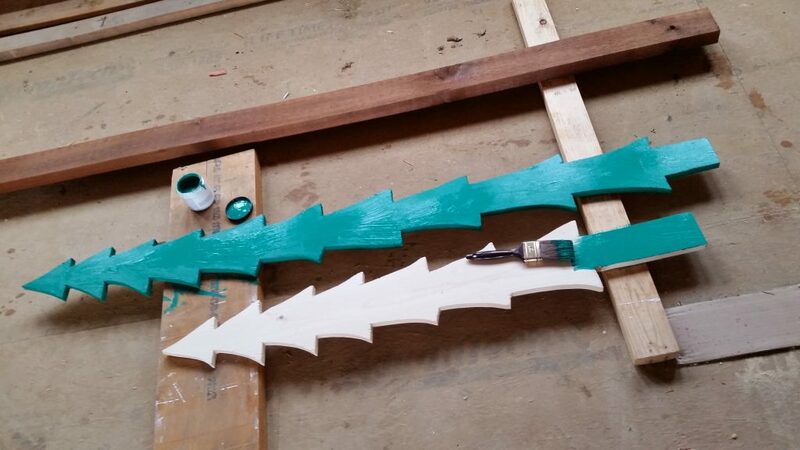 I just love the transformation and progress that comes with a project when the paint goes on. 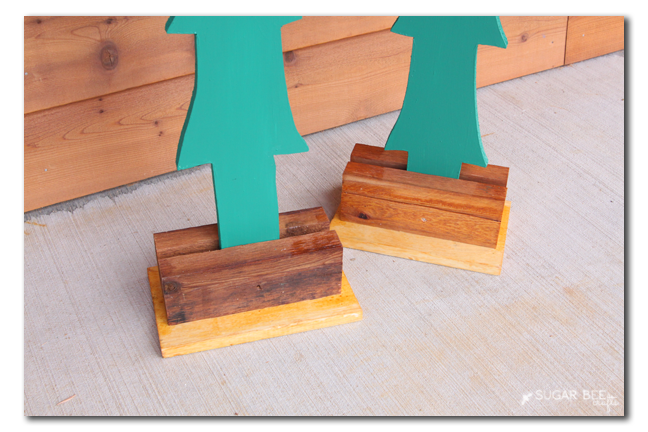 To create the base, you screw or nail a scrap of 2×4 onto each side of the tree, then attach those to the flat base plate buy screwing in from the bottom of the base plate up through the 2×4. The wide base ensures that the trees won’t fall over. So fun, right?! 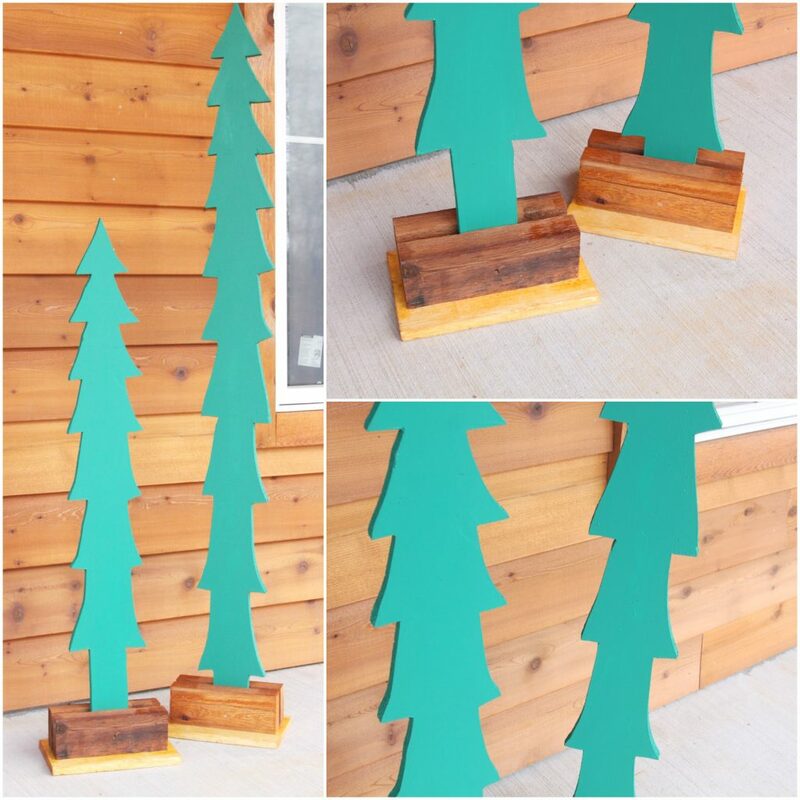 I can’t wait to drag out a bunch of holiday porch decor and really get them staged well. But first, build the house. Then the fun will follow! 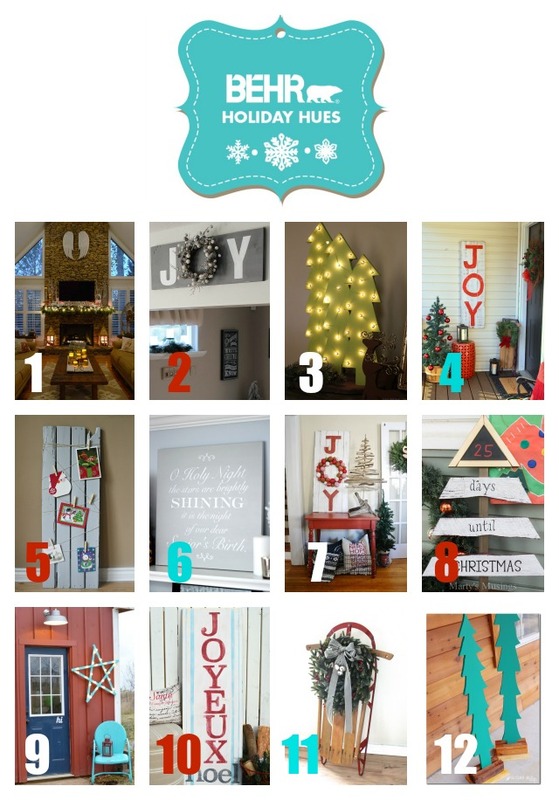 This project is part of Behr Holiday Hues – click around to see what the other bloggers created and be wowed by all the festive projects for the colorful holiday season! Mandy – these are AWESOME! 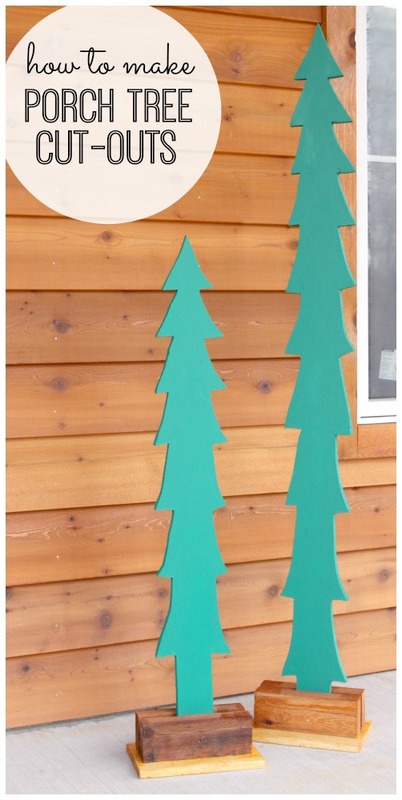 I love that they are tall and seem to be pretty easy to make. Great project! There is not a link for your trees, #12, and I had to scroll through the other eleven to find you. I found a ping back link, and ta da! there you are! 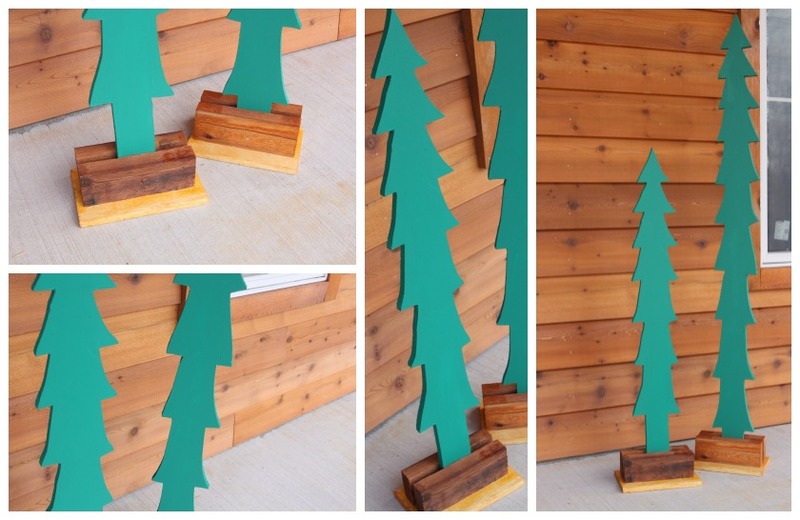 Thank you for explaining the base of the tree and making it so easy to make. Thank you for explaining the spacing of the triangles, because that is exactly what I had missing in the trees I made. Thank you for sharing your talent, tidbits, and helpful hints. Blessings to You and Yours, from Port Huron, Michigan. Any color would be perfect. I really like teal, purple & cream colors. ooh, that would look great!! So pretty and so simple. Certainly I can do this! Thanks for your post. LOVE LOVE LOVE those trees!!! You did such a great job!!! I so love any color in the Opulence line!!!! I love this, Mandy! 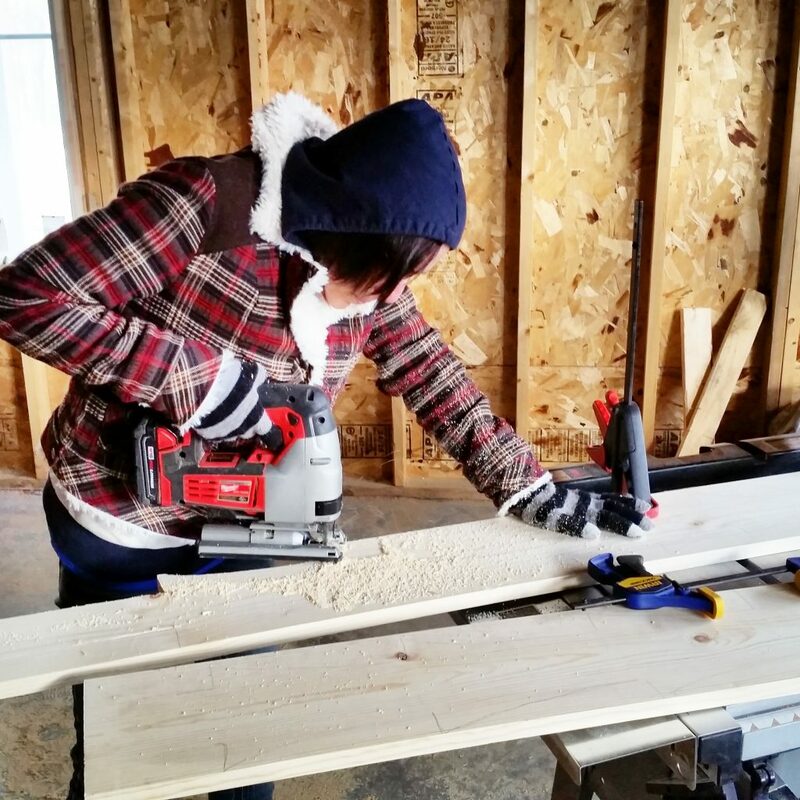 You girls are awesome with your power tools. Great job! Another really cute project. I am asking Santa for a saw for Christmas. Just not sure if it should be a jigsaw or a circular saw. Trying to decide what I will get more use out of.